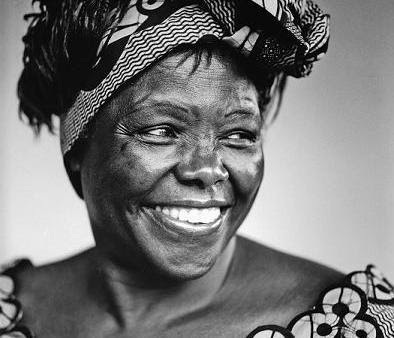 Wangari Muta Mary Jo Maathai was a Kenyan environmental and political activist. In the 1970s, Maathai founded the Green Belt Movement, which has planted more than 10 million trees. She was the first woman in central or eastern Africa to hold a Ph.D., the first woman head of a university department in Kenya, and the very first African woman to win the Nobel Prize in Peace. Maathai was one of the founders of The Nobel Women's Initiative along with sister Nobel Peace laureates Jody Williams, Shirin Ebadi, Rigoberta Menchu Tum, Betty Williams and Mairead Corrigan Maguire. Six women representing North America and South America, Europe, the Middle East and Africa decided to bring together their experiences in a united effort for peace with justice and equality. It is the goal of the Nobel Women's Initiative to help strengthen work being done in support of women's rights around the world. “Professor Maathai introduced the idea of women planting trees in Kenya to reduce poverty and conserve the environment,” in a statement. “At last count, the Green Belt Movement she helped to found had assisted women to plant more than 40 million trees. She understood and acted on the inextricable links between poverty, rights and environmental sustainability. One can but marvel at her foresight and the scope of her success. She was a true African heroine,” the statement continued.